By now you know that the death of Manti Te'o's girlfriend -- which quickly became one of the more sympathetic stories of the college football season -- was a hoax. In fact, she was a hoax: such a girlfriend never existed, and was merely a series of digital smokescreens and dummy Twitter profiles set up by someone who was not who they said they were. The degree to which Te'o was in on said hoax is still up for debate. One possibility -- one that Te'o's supporters are clinging to -- is that he's a sheltered kid from a close-knit Mormon background that had an online girlfriend (one he didn't know wasn't a real person) who lied about meeting her because... he was embarassed he had an an online girlfriend. That's the spin Te'o and Notre Dame are putting on things, at least. If that's indeed the case, and Te'o was the victim here, then, well, we can nary think of a more embarrassing end to a largely successful senior season: finding out your dead online girlfriend is alive but was really a dude the whole time, a blowout BCS loss to Alabama, everyone else finding out your dead online girlfriend is alive but was really a dude the whole time, and, finally, becoming a meme. Get ready to feel terrible. The act of hanging out with your invisible girlfriend. There's a lot of these. Like this one. Because Manti Te'o's been chatting online with babes all day. A reference to this and this. 5. The Usual Suspects and Manti. After that, my guess is you'll never hear from her again. 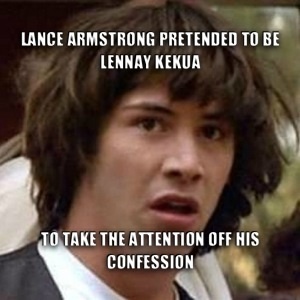 Yes, this is Lennay Kekua. The kid who can never catch a break gets his (imaginary) girlfriend stolen by a football player. ...without making fun of this guy.